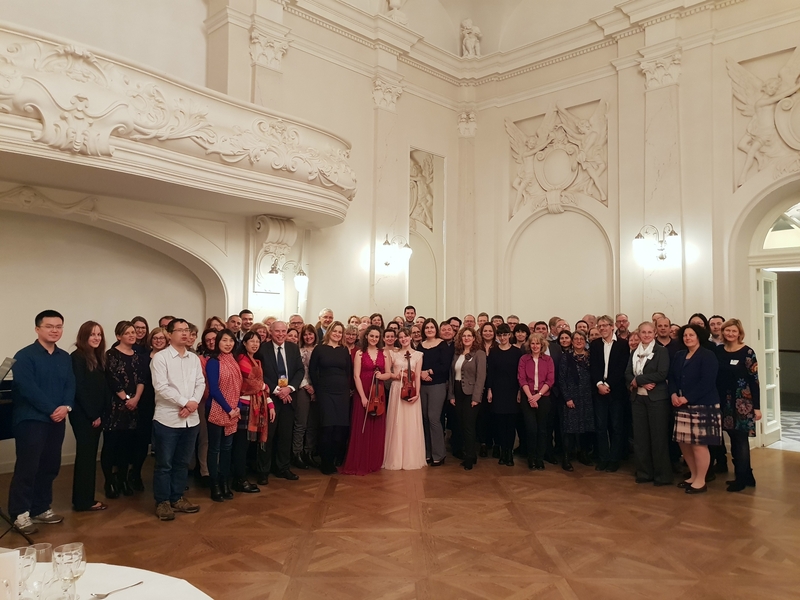 This year the EUSCREEN study’s annual meeting was held in Poznan, Poland, on Friday, March 8, 2019. All Country Representatives for hearing, vision and general screening were invited to attend the meeting, held at the city’s Medical University’s Congress Centre. We started the day with a word of welcome by the study coordinator, followed by a plenary session with presentations from Consortium Partners of the EUSCREEN study about data collection of all screening programmes by Erasmus MC (EMC) and validation of this data by the Karolinska Institutet in Stockholm (hearing) and University of Sheffield (vision). Overall, a lot of data have been collected on existing screening programmes across Europe and beyond. For general screening no data has been collected for Iceland, Luxembourg and Portugal to date. The presentations from EMC, Stockholm and Sheffield illustrated that screening throughout all countries is very diverse. For general screening sufficient data were provided by 38 European countries. In roughly half the countries the data were provided by a specific Country Representative for general screening; in the remainder by Country Representatives for hearing and/or vision screening. Data on general screening were provided by a variety of altogether 22 different professionals. For vision screening it was illustrated that there were differences between countries and regions in vision screening according to the organisation of screening, the funding of screening and the location(s) where visual acuity measurement takes place. For hearing screening, the data showed that most European countries have a neonatal hearing screening programme performed in the maternity hospital within the first three days after birth. Differences were found in the organization of screening and funding. Stockholm analysed and validated the submitted data. They presented their methods in checking the data for completeness, internal congruency, references and external congruency. The number of tests performed before discharge and reporting differs between countries when looking at infants born healthy. For infants at risk for hearing impairment some countries use only OAE for screening. Others use a combination of OAE and aABR or aABR only. In general, fewer steps are used than the protocol for health infants. Sheffield presented that there often is a wide variation within and between countries, that vision screening is being funded without evidence of need within a country or a region, delivered without evidence of effectiveness and that there are no cost-effectiveness models in place. After these presentations on general, vision and hearing screening a presentation was given by Tirana about the implementation of neonatal hearing screening that is currently taking place in Albania. The preparations made, start of implementation and preliminary outcome results were covered as well as the challenges they encountered. The challenges included convincing parents to return for follow up screening after a ‘no clear’ response, the database, difficulties in contacting these parents and low return rates in winter. DASM presented their experiences on implementation of vision screening in the county of Cluj in Romania. Implementing vision screening in the city of Cluj-Napoca appeared to be very efficient since screening is performed by nurses that are already employed by the kindergarten and present every day. This was followed by another presentation from EMC about the development of the micro-simulation models for hearing and vision screening. It illustrated how calculations are being made for predictions of detections and referrals with vision screening at a certain age and with hearing screening by different strategies. The presentations contained a lot of new and interesting information for all attendees and led to interesting talks during the coffee break. We observed people from different countries and domains (hearing, vision and general paediatric screening) interacted and exchanged thoughts on the subject. In the next plenary session more detailed information was given by Sheffield, Stockholm, Frankfurt and Reading. Sheffield presented some interesting current vision screening issues: once again it appeared that there is a huge variation in the existing programmes in all countries, but also many countries are currently screening for many varied or undefined conditions. Stockholm presented about quality assurance and benchmark indicators of infant hearing screening and compared well known benchmark indicators to existing screening programmes across Europe. They concluded that these indicators are calculated differently for different programmes and thus are hard to compare. Frankfurt presented the objective: to increase the competence of screeners in vision screening. This was being done by courses that were given in Cluj-Napoca, given with background information on amblyopia and different methods of testing visual acuity. Reading presented an alternative, additional method of vision screening which assesses risk factors for the development of amblyopia: photo screening. This is a way of screening that screens for risk factors and not for actual conditions. The comparison was made between the measurement of visual acuity pre-school with photoscreening at an earlier age or without, which was very interesting. We are very grateful for the contributions of Coralie Hemptinne (Belgium, Wallonia), Yair Morad (Israel), Hans Limburg (India) and Lisa Rubin (Israel). Their presentations covered current vision and hearing screening programmes in their countries. Coralie Hemptinne presented the Belgian perspective on vision screening. It was interesting to see how vision screening is being organised in a country with three different regions and therefore also differences in age of testing, tests used and professions that administer testing visual acuity. Yair Morad introduced the very effective database on medical examinations and history in Israel. Since military service is obligatory and everyone needs a medical examination prior to it, a lot of medical data is in that database. It was interesting to see that the prevalence of unilateral amblyopia decreased over the years, which is probably due to better screening. Lisa Rubin presented the current neonatal hearing screening programme in Israel. The results showed that both the age at diagnosis and age at intervention has improved. Hans Limburg presented on behalf of India the way vision screening is implemented 25 years ago in India. It is being done at school, teachers were educated to do this and it appeared highly effective. Also interesting to hear that having glasses in India makes you less attractive for marriage, but makes you look smarter in Africa! During the lunchbreak we had another opportunity to talk to each other and exchange ideas. We were happy to see many conversations happening between countries and domains once more, as one of the goals of the EUSCREEN study is to make countries more aware of what’s happening in other countries. For us it was a good opportunity to talk to some of you in person. At last we were able to match faces with names! In the afternoon, the Consortium Partners from Erasmus MC, Tirana and UMF Cluj-Napoca discussed four more topics: the extension of the model with a pre-module for Low and Middle Income Countries, scaling up neonatal hearing screening in Albania and the difficulties encountered in Romania during implementation of vision screening in rural areas. This session was concluded by Erasmus with a presentation on the cost-effectiveness model; examples were given on countries with too much or too little screening. Erasmus MC introduced the pre-module that is added to the model to accommodate Low and Middle Income Countries. They showed how appropriateness, acceptability and sustainability are being addressed in the model. Especially for the Low and Middle Income Countries this can be a valuable addition. UMF Cluj-Napoca reported on the difficulties there were and still are in implementing vision screening in rural areas. These comprised low interest from medical staff, low awareness at the parents on importance of screening, low attendance of children at kindergartens due to migration or parents that bring their children to kindergartens in the city. Fortunately, they also presented a plan to increase the number of rural children being screened for the rest of the implementation period and we look forward to a more positive number of children being screened in the second half of implementation. In Albania, the neonatal hearing screening programme is going well, both in urban as in rural areas. The evaluation specific for the implementation in these rural areas was presented because it is very important within the country-wide perspective. They looked into expanding the screening programme for the whole country and the costs that will have to be made. They concluded a gradual scaling up would work best in Albania. After another coffee break, simultaneous sessions on the model took place: a model demonstration by Harry de Koning, a model try-out with practical exercise for hearing screening by Mirjam Valk Bonilla and a model try-out with practical exercise for vision screening by Eveline Heijnsdijk. These simultaneous sessions were very informative and effective for everyone involved. In all three sessions valuable feedback from the Country Representatives was given to extend and improve the model. A summary of these sessions can be found in a separate document, written by the people who developed the model. This first EUSCREEN conference, filled with intensive sessions was followed by an authentic Polish dinner in Bazar Poznanski. This venue was used by both Henryk Wieniawski and Ignacy Paderewsky to play their music in 1854 and in 1918. Music was played by both Wieniawski and Paderewsky in between courses by two brilliant students on the violin accompanied by their teacher on piano. We look back on a fruitful and interesting conference with all Country Representatives and a great meal in a beautiful surrounding. We appreciate all of the feedback that has been given in person or through email after the conference. We thank everyone for their comments and participation and hope to see you all on our next conference in November 2020!